Berkeley nuclear licensed site, initially constructed between 1957 and 1962, is currently undergoing a programme of decomissioning, following 30 years of operational life. As part of this programme, intermediate level wastes such as Fuel Element Debris, Miscellaneous Contaminated Items and Activated Components must be retrieved from Active Waste Vaults and other locations on the Berkeley site, processed and packaged in Ductile Cast Iron Containers, conditioned and interim stored prior to final disposal at a Geological Disposal Facility. The end client is Magnox Limited, with Cavendish Nuclear Limited the contractor, and Qualter Hall a sub-contractor for two packages of highly sophisticated nuclear waste handling equipment involving robotics with fully integrated control systems. The order for Package 1 was placed in December 2012, Package 2 in February 2013 with both packages to be completed during 2014. For Package 1, Qualter Hall is responsible for the concept design, manufacturing detailed design, manufacture, supply, assembly and integrated works testing of two Vault Retrieval Support Machines and associated equipment used to support the retrieval of all waste forms within the three Active Waste Vaults. Each of the machines includes a winch tower, remotely controlled robotic arm with various tools, hydraulic power equipment, control systems / panels / CCTV and structural steelwork. The purpose of the robotic arm is to sort and manipulate the material within the vault towards the vicinity of a waste removal grapple (Package 2), but does not at any time remove waste material from the vault. The two Vault Retrieval Support Machines are transferred as required between the three Active Waste Vaults. Package 2 required the manufacturing detailed design, manufacture, supply, assembly and integrated works testing of the Waste Retrieval and Transfer System, used to remove all waste forms from within the three Active Waste Vaults. The equipment includes, three vault shield doors, three load modules, two transfer tunnel modules, three grapple modules, a hydraulic power unit, control systems / panels / CCTV and structural steelwork. Each grapple module has a wire rope winch to which is attached a retrieval grapple used to retrieve waste from the vault and deliver it into a waste transfer tray, which then continues on its journey through the tunnel module via a rail system finally delivering the waste to the appropriate processing module. 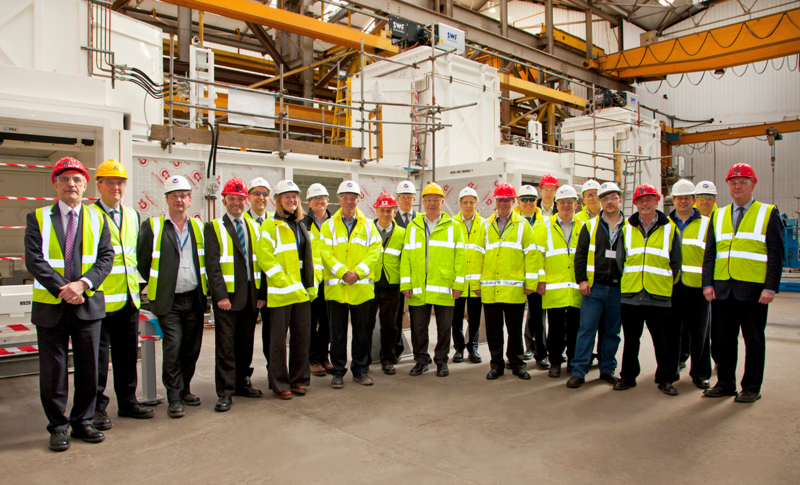 Earlier this year Qualter Hall in Barnsley was visited by all the major stakeholders in the project, as the attached photograph, who were able to view equipment on simulated testing in the works. This included representatives from the NDA, Magnox and Cavendish. Steve McNally, Site Director, said: "Our aim is to reduce risk and cost associated with the Magnox programme through innovative approaches to decommissioning. The bespoke design of the vault retrieval support machines is a great example of this and has been achieved through integrated working with our supply chain." Says Qualter Hall's Managing Director, George Orton: "With the completion of this major commission for Cavendish Nuclear, along with a number of others, Qualter Hall further establishes itself as a key supplier to the nuclear industry for the design, manufacture and supply of highly specialised equipment."